The Ffestiniog Railway's annual Victorian Weekend, which gives everyone a chance to dress up and parade the railway's extensive collection of original and replica Victorian stock. 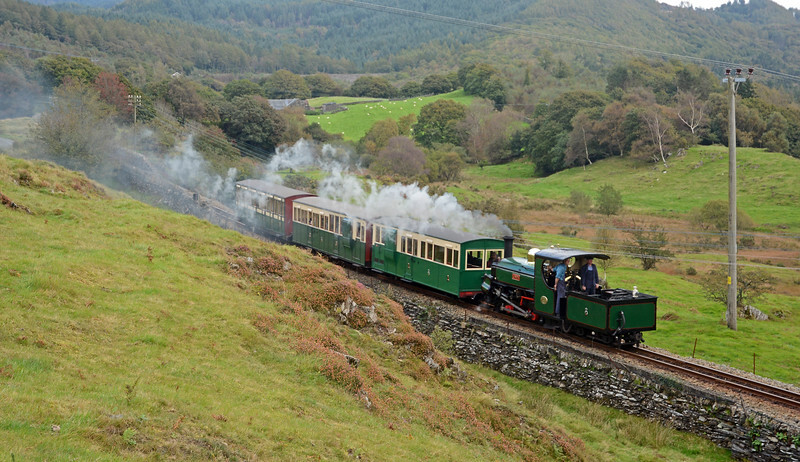 In addition on Sunday the railway ran a five car extra from Minfordd to Dinas (via extended stops at Boston Lodge and Beddgelert) for those members who also subscribe to the railway's appeals. New build improved Manning Wardle 2-6-2T Lyd was the motive power. Penrhyn Quarry Hunslet Linda on a 1950s era set from Tan-y-Bwlch to Porthmadog. Rhiw Goch is the location of a loop and signal box which is cut in on high days and holidays. You can see the outline of the box roof above and to the right of the telegraph pole behind the train.